The ultimate in luxury and class, this solid brass pen-stylus combination is nicely weighted and made of our highest quality materials. The top end features a 6mm silicone soft touch capacitive stylus tip while one twist of the glossy smooth barrel reveals a refillable ballpoint pen on the opposite end. 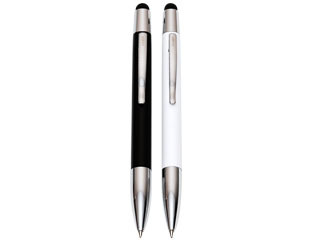 This premium stylus/pen is reminiscent of a high-priced classic executive pen while also offering additional compatibility with today’s newest technologies.